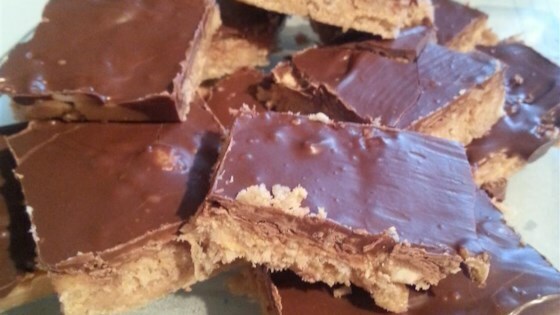 "A coco-nutty, peanut buttery, chocolately and crunchy bar-cookie!" Combine cereal and coconut in a medium size bowl. Combine peanut butter and peanuts in a large mixing bowl. Heat the sugar and corn syrup over a medium heat and stir constantly until the sugar is dissolved. Pour this mixture into the bowl with the peanut butter; mix well. Pour cereal mixture into the liquid mixture; mix well. Press the mixture into an ungreased 10x15 inch pan. Melt the butterscotch and chocolate chips over a medium-low heat; mix well. Spread the mixture over the pan of cereal mixture. Let cool before cutting into bars. Made these gluten free using GF corn flakes and rice chex. Followed recipe exactly. Love the ' bulk ' of the cereal and peanuts. Very sweet; a little dab'll do you! Yummy! Better than rice crisp bars with marshmallow creme!